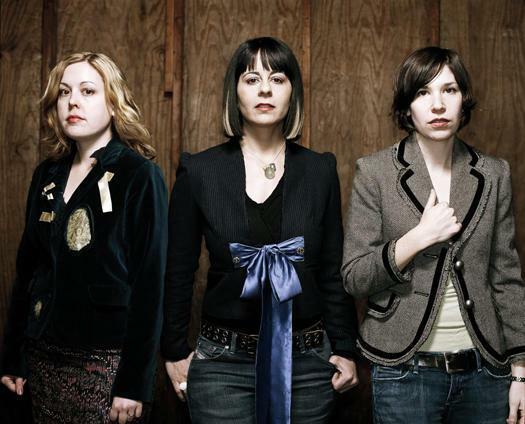 I’ve been a HUGE fan of Sleater-Kinney since 2000. On the old radio show in college (KJHK), we used to play their music all the time, particularly one of my favorites, “Oh!‘ off their One Beat album. This all-chick rock band is as badass as it gets in rock music. Not to mention the drummer’s name is Janet Weiss (you should get that reference). But we told you that they were releasing a new album soon, which is called ‘No Cities to Love‘, which will hit shelves on the 20th. Highly suggest you pick it up. But to make things even more awesome, the band has concocted up a new music video that is all sorts of fun. They got some of their famous friends to sing along to the title track. You’ll be able to catch Fred Armisen, Andy Samberg, Miranda July, Norman Reedus, Sarah Silverman, Natasha Lyonne, Ellen Page, Connie Britton, and Nick Kroll to name a few who sing a long in this video. It reminds me of Michael Jackson’s old music video from the ‘Bad‘ album called ‘Liberian Girl‘. Below is the track list and dates for their upcoming tour. The GiganTour featuring: MegaDeath, Motorhead, Volbeat, and Lacuna Coil Dallas, TX March 1, 2012!!! Check Out Tom Waits’ Speech and Performance From The Rock N’ Roll Hall Of Fame Induction Ceremony!!! This entry was posted on Thursday, January 15th, 2015 at 2:16 pm	and is filed under Music, News. You can follow any responses to this entry through the RSS 2.0 feed. You can skip to the end and leave a response. Pinging is currently not allowed. « Blu-ray Review: ‘Boardwalk Empire’ Season 5! !